Washington (CNN) - After dodging the issue for months, House Speaker John Boehner on Wednesday took a position on citizenship for undocumented immigrants, saying Congress must deal with the children of those who are in the United States illegally. "This is about basic fairness. These children were brought here on no accord of their own. And frankly, they are in a very difficult position. And I think many of our members believe that this issue needs to be addressed," Boehner said at the weekly press conference with House GOP leaders. Boehner has made it clear the House will not take up the bipartisan immigration bill that passed the Senate, which did provide a path to citizenship, but the speaker has repeatedly sidestepped the issue of whether he could support any sort of legalization proposal. Although Boehner did finally weigh in on one component of reform, he would not say how the House would ultimately address the broader issue of the 11 million undocumented workers currently in the United States. But he did repeat earlier comments that he believed addressing the status of those here illegally was part of the overall problem Congress needs to tackle. "We are trying to be deliberative in terms of how we deal with all of these issues, both fixing the problem with border security and enforcement, how to fix a broken legal immigration system, and yes – we've got the problem with those who are here who are undocumented," Boehner said. Most House Republicans oppose allowing eventual citizenship for undocumented immigrants in the country. But at a meeting last week of all House Republicans, House Majority Leader Eric Cantor suggested that children fall into a special category and shouldn't be penalized for their parents' decision to break the law. According to several members who attended the closed door session, many agreed with that approach. The details are still unclear, but Cantor and House Judiciary Committee Chairman Bob Goodlatte, R-Virginia, are drafting legislation that provides some type of process permitting citizenship for these children. "The history of our country is one that has moved away from holding kids liable for the deeds, misdeeds, commitment of crimes by parents. These are, in many instances, kids without a country if we don't allow them to become full citizens of our country," Cantor told reporters Wednesday. The House Judiciary Committee, which has passed several piecemeal immigration bills on party line votes, announced it would hold its first hearing on the topic of children next week. House Democrats have criticized GOP leaders for not working across the aisle on immigration legislation. "They're allowing once again, the tea party element in the Republican Party to drive the immigration debate," House Democratic Caucus Chairman Xavier Becerra, D-California, said Wednesday. Becerra and a group of lawmakers from both parties have been working on a comprehensive bipartisan immigration bill, but the group has had trouble finalizing the proposal. Pressed when the House would actually vote on immigration legislation, Boehner punted, saying "it's too early to predict what we will or won't do." Reis still has dozens of bills tabled in the senate. Mr. Obstructionist Reid is the biggest problem in congress. "It wasn't the kids that broke the law. It was their criminal parents." Except it's a civil offense, not criminal. Read. Learn. Speak. In that order. I've asked on several occasions, counselor – what's your objection to making this a federal offense, since immigration laws are "supposed" to be enforced at the federal level? because that would be mean, mean, mean... these people are just trying to get a better life and some welfare, maybe some education, and maybe some free housing, and possibly free food and a free cell phone. and the statue of liberty says get over here everybody, we want you to invade our country. and after all, every other country in the world does this too, right? the real answer: because the government never was serious about enforcing immigration laws and never will be. Why should that bother you? You're always screaming that laws and regulations impede freedom, so why do you object to illegals? They should be the righties heros. "2 things: one, who would you propose to pay for enforcement of this new federal law, and why would any conservative be advocating for putting new laws on the books when we already have laws to deal with this? " Clearly the federal governent can't effectively enforce them, or else there wouldn't be 11+ million illegals in the country. And yet when states pass laws in an attempt to enforce, the DOJ sues the state under the premise that it's the federal government's sole authority to enforce immigration laws. I mean really???? You're a reasonable person, Tom... you can't see the insanity of this? Why not just raise the white flag and do away with borders altogether? The Fourteenth Amendment is very clear. It states: "All persons BORN or naturalized IN THE UNITED STATES, and subject to the jurisdiction thereof, ARE CITIZENS OF THE UNITED STATES and of the State wherein they reside..." As part of the Constitution, the Fourteenth Amendment can be changed only by another amendment to the Constitution. Good luck with that, Republicans. You can't even repeal Obamacare. So they care about the children, huh? Between this and their stance on abortion it doesnt look like republicans care too much about your rights if your over the age of 18. Repos don't care about anyone of any age. Orange Boehner just likes to hear himself talk. I predict nothing coming out of this faux outrage but more vacation time. And this folks has been their pattern of addressing every issue since taking office. ".... These are, in many instances, kids without a country if we don't allow them to become full citizens of our country," Cantor told reporters Wednesday. There are some people who would call that "amnesty." I would call it caught between a rock and a hard place. Fair, the responsibilites of international borders clearly lies with the federal government. No one disputes that, except those that rediscover nullification every generation or so who insist that authority can be assumed by states because a hysterical segment demands it. Am I satisfied with the current situation? No, not in the least, but by the same token, no solution is 100% effective, either. Obama has been far more effective than the Right has given him credit for, and yet that's still not good enough. Building a immigration version of the Maginot line will NOT seal the border, which the Right assumes is like a ziploc bag. We need a program that effectively tracks people once they enter this country as well as border security. The immediate problem is what do we do with the 11 million illegals we have? How can the Right justify the huge expense of their approach when they demand everything else be slashed? You're intelligent, can you see how hypocrical this is, as well as unworkable? 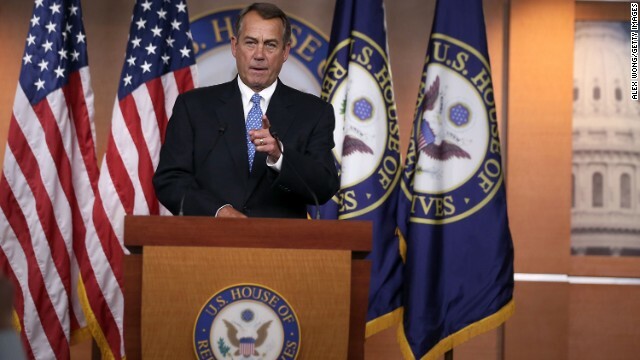 Speaker Boehner must show courage and stand up to Tea Partiers in his caucus. He can demonstrate true leadership by forming a bipartisan coallition of pro-immigration reform Republicans and Democrats. ROFLMAO -- Boehner only knows how to drink Jack and cry. He's not fit to do anything but pretend to stand up to the President. He's a GOP prop with strings coming out of his rear. So I've figured out a solution to the filibuster rule. A old fashioned duel! Two congressmen back to back each, takes ten paces, turn and shoot. I bet they'll only use a filibuster when it's needed. ""It wasn't the kids that broke the law. It was their criminal parents." I've asked on several occasions, counselor – what's your objection to making this a federal offense, since immigration laws are "supposed" to be enforced at the federal level?" It is a federal offense. "Civil" doesn't automatically mean "local" or "state level." Making it criminal is unnecessary and would fix nothing. The only people advocating it are hateful, spiteful morons and the private prison industry, neither of which have any practical, rational, cogent arguments in favor of such a change. Besides, do you have any freekin idea how stupid it sounds to say "you came here illegally, so we're going to keep you here in a prison for a set amount of time before we deport you"? Deportation is quicker, and we already have the ability to temporarily hold people who need to be deported. Handing them lengthy "criminal" jail sentences is absurd and would be expensive...hence, the private prison industry's lobbying for that sweet sweet gov't milk. "the DOJ sues the state under the premise that it's the federal government's sole authority to enforce immigration laws. " It is. So yeah, "really." Children in the country through no falt of their own. Whose fault is it? The millions of school children that do not receive a quality education because they have to learn at the rate of non english speaking children can learn? The students that can not get assistance with college because the illegal children receive all of the assistance money? The taxpayers that work and pay taxes that house,feed and clothe the illegal children? And the lists goes on and on, with these illegal children taking from the legal children. Who cares about the taxpayers children? Not the people elected to enforce the laws of the land that are supposed to protect all citizens. Who benefits from the illegals? Big business! Cheap labor paid for on the backs of the working taxpayer and their children is the reason.